The Oklahoma Community Anchor Network (OCAN) offers high-speed broadband services to rural and underserved areas of Oklahoma. By offering more robust access to broadband services for community anchor institutions and creating opportunities for public-private partnerships, OCAN supports economic growth and improves services for Oklahoma’s rural and underserved citizens. Completed in July 2013, OCAN is a middle-mile infrastructure of 1,005 miles of high-speed broadband fiber. OCAN was funded through a $74 million grant from the National Telecommunications and Information Administration under the Broadband Technology Opportunities Program, along with $19 million in-kind state match. 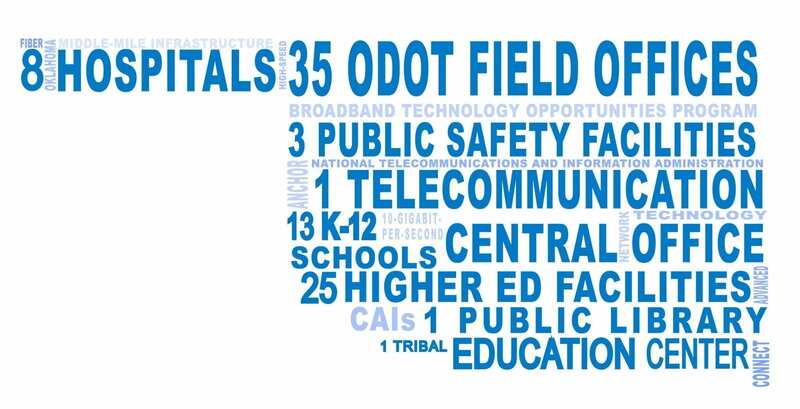 Prior to OCAN’s construction, several state agencies operated technology networks throughout Oklahoma. OCAN bridges these disparate networks to form an aligned network reaching remote areas of the state not served by the existing networks. The new network reaches 35 Oklahoma counties and connects 87 community anchor institutions. Community anchor institutions (CAIs) provide vital services to a community, such as schools, colleges and universities, career technology centers, libraries, town halls, police and fire stations and health care facilities. OCAN initially connected 33 CAIs to the network. These original 33 institutions not only receive services through the network, but also house some of the equipment necessary for operating the network. Since its completion, 54 additional CAIs have had the opportunity to connect to the network through OneNet, who operates and maintains OCAN. OneNet is a division of the Oklahoma State Regents for Higher Education and Oklahoma’s only statewide internet service provider. Educational institutions, health care providers, public service agencies and nonprofits have the opportunity to connect to the network by choosing OneNet as their internet service provider. In addition, local telecommunications providers can partner with OCAN to extend services to the private sector. Through these public-private partnerships, OCAN provides opportunities for small businesses and expands economic growth in Oklahoma’s rural communities. OCAN benefits Oklahoma’s citizens by improving educational, public health and safety services in Oklahoma’s rural communities. High-speed networks are critical to removing barriers for the state’s educational institutions, governments and service providers. These institutions require access to high-speed Internet to deliver services in today’s digital economy, making OCAN essential for growth and innovation in rural areas across the state. For more information, visit the OCAN FAQ page.